The Ukrainian Association of Visual Artists of Canada (USOM) was founded in 1955 – 1956 by the arts activists Mykhailo Dmytrenko, Bohdan Stebelsky and Ivan Keywan with the support of other like-minded artists. The Association has included such notable members as Mykhailo Dmytrenko, Bohdan Stebelsky, Ivan Keywan, William Kurelek, Leo Mol, Myron Levytsky and Mykola Bidniak. Among the senior members, who continue to work actively, are the well-known artists Andrij Babytsch, Halyna Novakiwsky, Irena Moroz, Irene Nosyk, Lydia Palij, Maria Styranka and others. Currently, USOM’s membership numbers around 50 artists representing several generations. For over half a century, USOM has been an actively functioning organization in Canada. 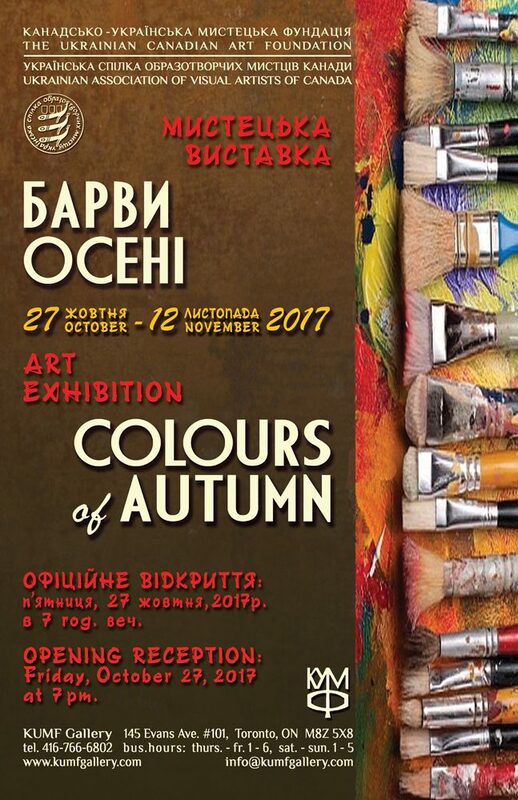 The Association’s goals are to unite professional artists of Ukrainian descent and to promote their work, to be active in the development of Ukrainian art in Canada, to organize group and solo exhibitions, to organize art-related evenings and events, and to publish exhibition catalogues and other works about art. During its existence, USOM and its individual members have presented and continue to present artwork in a wide creative range at Canadian and international exhibitions and competitions where they have received recognition and awards for their mastery and exploration of cutting edge directions and themes – which allow the artist to attain full self-expression, diversity in artistic orientation and innovative ideas. USOM is also an active participant in the cultural life of Canada’s Ukrainian community. The Association continually organizes or participates in exhibitions and auctions which benefit nursery schools, day schools, churches, organizations, and charities such as Children of Chornobyl and Aid to Ukraine. USOM members frequently donate their artwork for these causes. The artists of USOM work in the areas of painting, sculpture, graphics, iconography, mosaics, and monumental art. Their artworks depict a variety of subjects: the history of Ukraine and her people’s struggle for freedom and independence, traditions, everyday life, portraits, landscape, still life and contemporary themes.